Q&A with Nigel Roberts, Manager Digital Services and Mobility, City of Mississauga, Ontario. The City of Mississauga may be the sixth largest city in Canada, but it's a leader when it comes to using technology to enhance services for residents and businesses. The City has a strong digital presence on the web and uses social media, YouTube, and video streaming of City Public Meetings and other events. 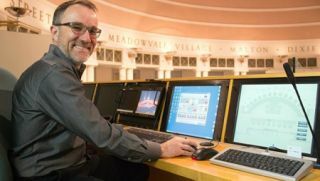 AV Technology magazine recently asked Nigel Roberts, manager of digital services and mobility of the City of Mississauga, about his take on technology for the public good. We also asked him to share best practices for AV/IT convergence, BYOD, and collaboration in the government sector. Nigel Roberts: The City has been video streaming its Council and Committee meetings for many years and publishes the videos, minutes and agendas on the City’s website. This creates a transparent and inclusive way for residents to participate and access the official business of the City and decisions of Council as well as key events. Council recently adopted a new IT Master Plan that sets the high level direction for the corporation to adopt and employ technology. AV and digital services play a key role in how the City of Mississauga fosters open and transparent government. Nigel Roberts: The use of video to capture events, storytelling, and promoting services is a rapidly growing service that AV provides; this continues to drive value and align with providing services via online and mobile. Recently, the AV team was challenged to create a large video wall to support the operations of the Advanced Traffic Management System. The wall has been built and is functioning in line with our project objectives and goals. We aim to make better use of video and map-based technology to enhance the movement of traffic. Nigel Roberts: With a growing mobile workforce and the convergence of video/display technology with the new designs of office space, there is an opportunity to significantly advance the use of peer-to-peer and group meetings with AV. Using video and audio as a standard for carrying out all meetings whether you are in an office, a meeting room or mobile and offsite, has tremendous benefits. Nigel Roberts: We will likely be expanding our digital signage fleet and enhancing that with beacon or proximity technology to enhance the video experience. There are so many opportunities to consider, we just need to be sure that they align with the priorities of the corporation just like the video wall for the Advanced Traffic Management System. Nigel Roberts: The City of Mississauga procures all goods and services according to the Purchasing By-Law. This does have flexibility including RFP, tender or leveraging other opportunities such as provincial agreements. Nigel Roberts: I am not too sure, but I think that we are doing a good job in building our relationship with industry and are leading in many ways. There is risk in adopting technology too early in its life cycle as we saw with the VHS/Beta issue. Nigel Roberts: We have a culture of collaboration and with the influx of retirements and onboarding from the new generation we are seeing more opportunities than barriers. The workforce is ready for video and mobility, and collaboration is one of the most accessible and effective ways of using video and audio. One thing is for sure, AV relies on many of the other IT services to ensure quality of product using the networks, data centers and digital realm to create and present digital assets and engagements. Do you know an outstanding CTO, Media Manage, or AV/IT Director who is embracing next-gen technology? Email mdouaihy@nbmedia.com.